Welcome to historic El Cerrito! Home to Native Americans for centuries, the area known today as El Cerrito (the “Little Hill,” referring to what is now called Albany Hill) was settled by Victor Ramon Castro in 1836. The city incorporated in 1917. Our town was home to quarries, gambling and nightlife. Since the 1940s El Cerrito has been accurately known as a “City of Homes.” As you walk along San Pablo Avenue, notice the Historic-Cultural Pavers that dot the sidewalk, providing much historical information. Site of the Victor Ramon Castro Adobe. Now part of El Cerrito Plaza. The Castro Adobe was halfway between San Pablo Avenue and the current CVS drug store. It was the first building by a Californio in what is today El Cerrito. 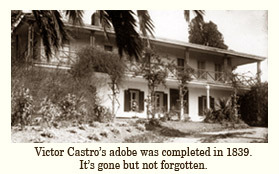 Much expanded over the years as home to Castro and his family. By 1928 it had become a popular nightclub, the Rancho San Pablo. Also on the site of the former Castro rancho was a greyhound racing track (El Cerrito Kennel Club, 1932-1939), a trailer camp for World War II in dustry workers, and the El Cerrito Motor Movies, a drive-in. El Cerrito Plaza opened in 1958, two years after the adobe was destroyed by fire. Old West Gun Room. 3509 Carlson Blvd. Notable for its rustic, handmade and picturesque architecture of oak and rock. Built 1948 by owner, Clarence Miller as the San Pan Antique Shop, it became a gun store in 1969. Former County Line Cleaners now the Bead Biz, 9955 San Pablo Avenue. One of the last architectural remnants of the city’s early Japanese community, the laundry was run by Kenichi and Tomiyo Nawata. The building is from the late 1930s. Notice the lovely brickwork. Former Bill Pechart’s Fortress, 9951 San Pablo Avenue, now an exercise center. He was a gambling czar in the 1930s, 40s & 50s. The powerful Mr. Pechart lived here in luxury, with reinforced concrete walls in case of police invasion. Home of one of the city’s first Mayors, Philip Lee. 6317 Fairmount Avenue. Phil Lee, who helped incorporate the city in 1917 and worked for Standard Oil (today Chevron) in Richmond, served as mayor for seven years. A staunch defender of the town from charges that it was a hotbed of vice, he also worked for a time at the dog track. El Cerrito Plaza BART Station. Both of the two El Cerrito BART stations were designed in 1969 by DeMars and Wells, whose partner Vernon DeMars was an important modern architect. 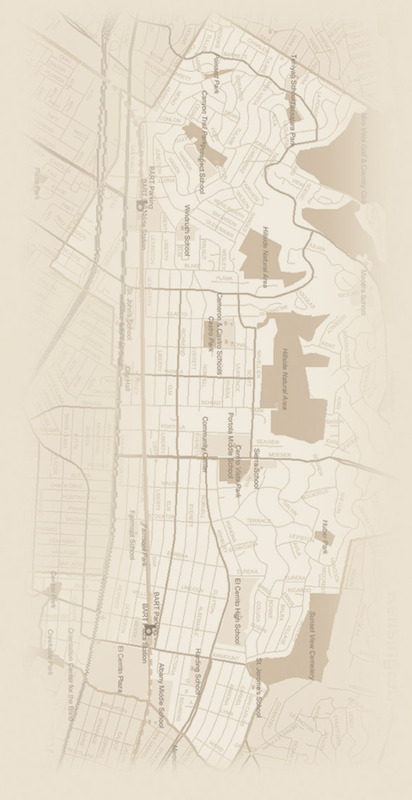 The other, 2 miles north, is El Cerrito del Norte, between Cutting Boulevard and Hill Street. Service began in 1972. Both stations contain abstract mosaic tile murals by Alfonso Pardi–as. Pastime Hardware, originally the Pastime Club. 10057 San Pablo Avenue. The present building is cobbled together from several existing buildings and its interior retains such historic mementoes as a former meeting and dance hall (which are inaccessible to the public.) Its longtime owners are the Pryde family. This was the site of William Rust’s Blacksmith Shop. Founded in the 1880s, it was one of El Cerrito’s original business. The area was called Rust after a post office was established at his store in 1909. Cerrito Theater, 10070 San Pablo Avenue, now Rialto Cinemas Cerrito. Opened on Christmas Day 1937 by the Blumenfeld chain, the Art Deco theater was designed by cinema architect William David and decorated by the famous Heinsbergen firm with murals, art glass and more. It served many years as furniture warehouse for the adjacent Kiefer’s Furniture, then was restored and reopened as a theater in 2006. The attached building to the north, at the corner of San Pablo and Central avenues, now a restaurant, was once home to prize fights as Little Madison Square Garden, and served as a workshop where Samuel Capelis of the Capelis Safety Aeroplane Corp. built small airplanes. Former Wagon Wheel, now Bayview Eagle’s Hall. 3223 Carlson Blvd. Gambler Big Bill Pechart ran the Wagon Wheel for many years in what was then called “No-Man’s Land.” Gambling halted in 1956 after the area was annexed to the city. The faux-half-timbered section is the original building, which still has many original details inside. This area was dotted with nightclubs and gambling halls from the teens through the early 1940s but only the Wagon Wheel remains relatively intact. Historic bungalow, 10152 San Pablo Avenue. One of a handful of early 20th century homes on the Avenue that retain their original appearance. Circa 1916. House shows typical dual-gable look of California bungalow. Pierre Allinio House, 609 Kearney. Early 20th century home, known as “the castle” because of its battlements. Allinio, artisan and plasterer, built a series of airplanes from the 1900s into the 1930s, flying some from a landing strip south of today’s Harding School on Ashbury Avenue. He was one of two aircraft makers in our small town. Down Home Music. 10341 San Pablo Avenue. Chris Strachwitz, one of the proprietors, played a leading role in the revival of roots American music from the 1960s in this important store; building also houses his record label, Arhoolie. The late Les Blank, famed documentary filmmaker of Flower Films, was also based here. Veteran’s Memorial Hall. 6401 Stockton Avenue. A simplified Gothic-style structure from 1932. Former Justice Court. 10504 San Pablo Avenue. Picturesque 5 two-story office building with a Monterey-style porch was built in the 1930s by Judge Joe Martyn Turner. Later occupied by Chamber of Commerce. Former Hillside Inn, today Hillside Garden Apartments. 10701 San Pablo Avenue. This picturesque former inn (now apartments) was originally the Stag House, circa 1912, and later the La Vyra Inn. A recent remodel altered some of its exterior fabric but it still recalls the old days. Former Mabuchi Flower Shop, 10848 San Pablo Avenue. Charming stone-faced buildings built as sales office in 1920s for the Valley of the Moon Quarry near Glen Ellen in Sonoma. From mid-1930s, run as floral shop and nursery by Mabuchi family, who moved a home onto site and attached it to the shop. They were interned during World War II but their property was preserved for them by the owner of an adjacent store, Fred Conwill. One of the last architectural remnants of the large and successful Japanese flower growing industry that flourished in north El Cerrito and Richmond. El Cerrito Public Safety Building. 10900 San Pablo Ave. Attractive modern ranch styling in this 1959 building designed by architect Milton Pflueger. Next door is City Hall at 10890 San Pablo Avenue. This 2009 neo-Craftsman style building by BSA Architects is a green building with natural lighting, radiant heat, rain gardens and more. The Historical Society’s Shadi Room, an archive and mini-museum, is in the tower. St. John the Baptist Catholic Church, 11150 San Pablo Avenue. St. John began as a mission of St. Paul in San Pablo. The first building on this site was Castro School; the church acquired the building in 1909. In 1925 St. John became an independent parish and in 1926 Shea & Shea Architects of San Francisco designed a Mission-style church, rectory and parish hall. The present structure, from 1947-1949, was designed by well-known Oakland architect William E. Schirmer, incorporating much of the earlier building. Former Poloni’s Market, now Giovanni’s Produce. 1600 Liberty Street. Unpretentious, though not unprepossessing store that recalls the days when this district was Little Italy. Originally the retail outlet for Baroni bakery faced onto Liberty, with the bakery in a separate building in back. Former Cerrito City Club, 1600 Kearney at Potrero, now offices and retail. Formed in 1942 by local businessmen for social purposes and to promote civic improvements, the attractive ranch-style structure was built in 1949. Former Vista Theater, now Atlas Liquor. 11382 San Pablo Avenue. Built in early 1940s as a movie house by the Blumenfeld chain, which also ran the Cerrito Theater. From 1959 to 1968 it served as the home of Contra Costa Civic Theatre, a community theater that remains popular to this day at another location. Cluster of early 20th century houses. 11453, 11457, 11471 San Pablo Avenue, all circa 1905-1915. All of these building were at one time private homes but some of them have now been converted to shops. Freeway Motel, 11645 San Pablo Avenue. It began in 1931 as roadside cabins that catered to travellers on US 40. It is one of the earliest such travelers’ accommodations in the area. Expanded over the years, the current structure went up about 1951. San Pablo Avenue, itself. The former El Camino Real and Contra Costa Road, it’s been the main highway in the East Bay to Oakland since the mid 19th century. It was part of the Lincoln Highway, which linked the East and West coasts in 1913, then was part of US 40. It is still a state highway; today San Pablo Avenue is State Route 123. Walking Tour map, please click on the links to the right. For a high resolution copy of the Walking Tour booklet, click here.